Band leader and main song writer Morten Veland has outdone himself on this new Sirenia album; everything has taken at least a step ahead. And he isn't the only one: Ailyn feels and sounds like an integrated part of the well oiled machine, and she has improved a lot over the years. Her vocal performance is the one the key factors why this album is their best to date. 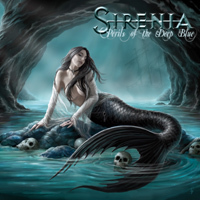 After a short intro the album is blown wide open with a song that represents everything Sirenia is about; strong guitar riffs, epic choirs, symphonic orchestration and a dark underlying atmosphere. And the impressive songs don't stop there, stop and take a listen to the 2 songs in Morten's native language Norwegian: "Ditt Endelikt" ("Your Demise") and "Stille Kom Døden" ("Quiet Came Death"), where they take their style to another level. "Perils of the Deep Blue" is without a doubt their best, most mature and versatile album to date; they take us into untested territory with ease and pass the test with flying colors. Maybe not an instant classic, but at least a very, very good album!